I happened to have two examples of LCP-compatible lasers on hand. Pistols with fixed sights of indifferent visibility definitely benefit from lasers for low-light use. I have seen more than one person go from 8 inch scatter to a tight 2 inch group with laser-sighted P3AT and LCP. Viridian Reactor R5 is a green laser for LCP or LC9 and has considerable daylight visibility. With batteries, it adds under an ounce to the weight. Production units are days away and will retail for about $176. 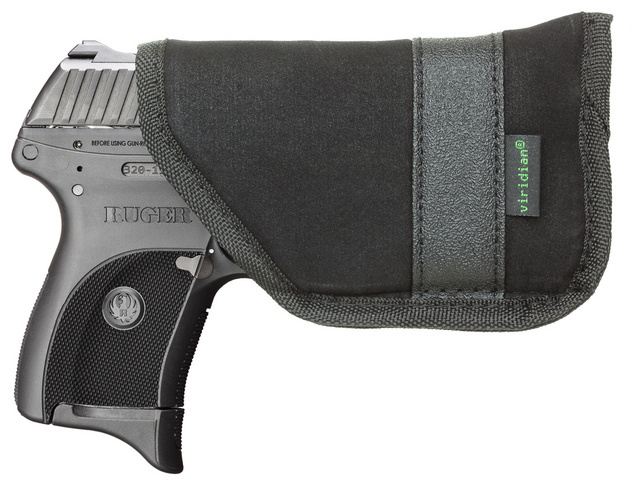 Several holsters are available, such as this Springtach universal IWB. 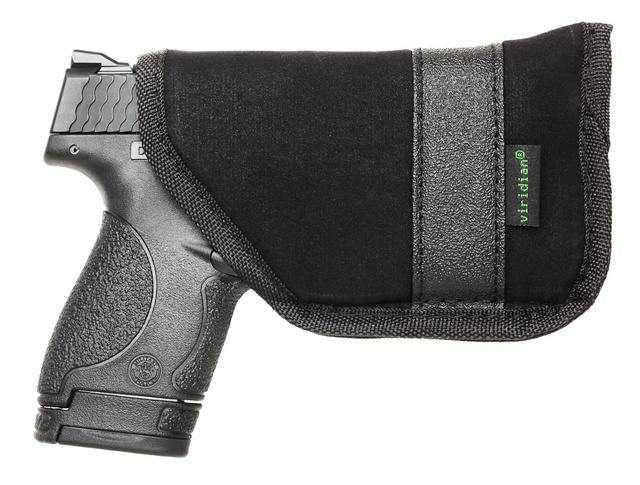 However, Viridian’s own holster has an extra feature (ECR) — it turns out the laser automatically when the pistol is unholstered. Manual on/off switch also works. 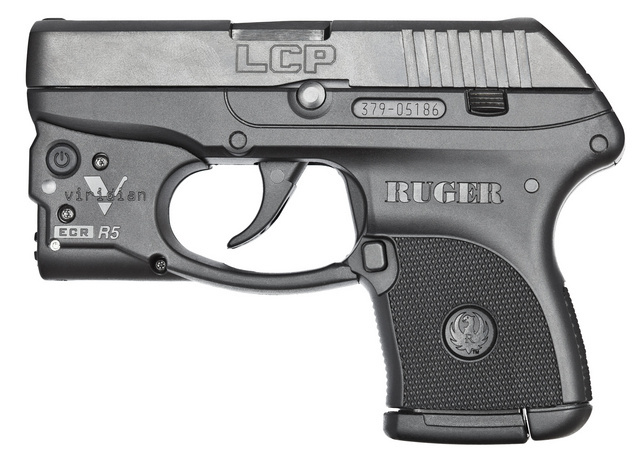 Below, ECR-capable holsters are shown with Ruger LC9 and M&P Shield. 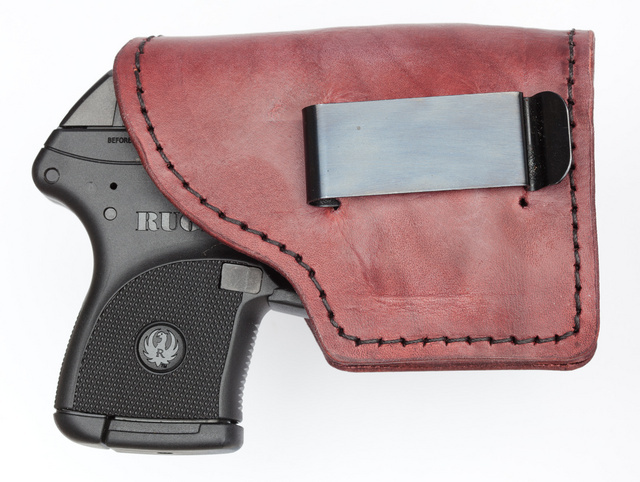 A holster adds just $24 to the price of the laser when bought with it. A cheaper red laser alternative, not as bright and without automatic switching, is already available from Lasermax. The on/off switch is an ambidextrous cross bolt. Being red, this laser is for low light situations only. Both devices appear to be of good build quality and both were easy to zero. This entry was posted in pistol, self-defense and tagged green, laser, red. Bookmark the permalink. I already have a NAA Guardian .380 so I don’t really need another pocket .380 but a co-worker has a LCP with Lasermax laser he’s thinking of trading in on something else and has said he’d sell to me for trade in. 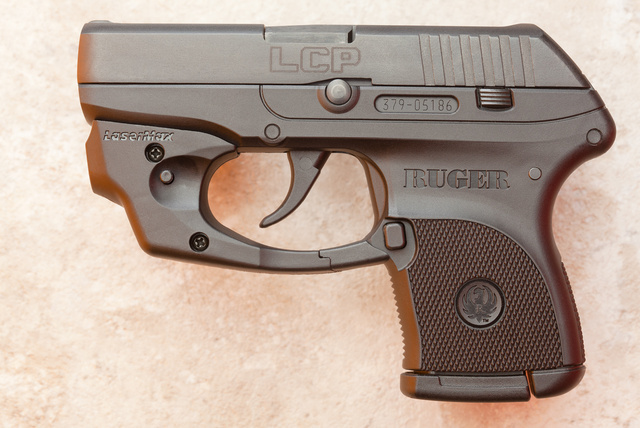 Crimson Trace also has a chin-mounted laser for the LCP. Mine is equipped with one, and it works quite well. 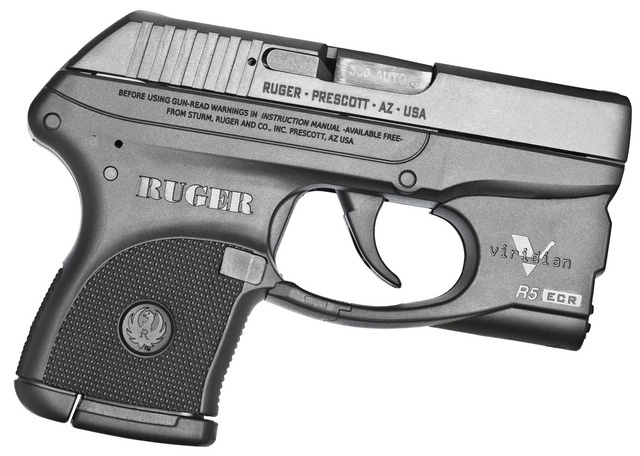 It has an “on” button on the front strap of the grip, right under the middle finger, as Crimson Trace products usually do. I don’t know what they cost now, but I gave $170 for it, which was right after it became available several years ago. it turns out the laser automatically when the pistol is unholstered.
? “turns on the laser when unholstered”? Or “turns out the laser when holstered“? “sights of indifferent visibility”. That’s one way of putting it. 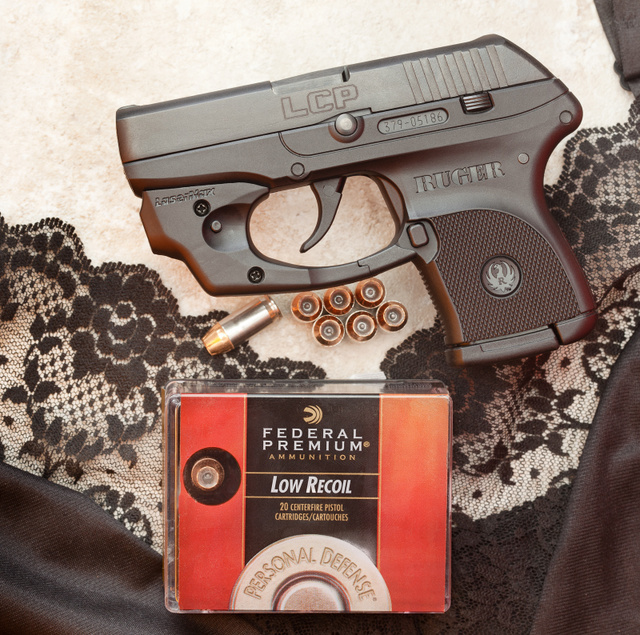 I can’t hit much deliberately, with my LCP. I am much better with only slightly bigger guns. So, I contemplate a laser. 1. The LaserMax is, in fact, less expensive, but it is definitely not “cheaper” in terms of quality. 2. The LaserMax option puts the laser emission point significantly closer to the bore line of the pistol, equating to a much closer relationship between the Point-of-Aim and Point-of-Impact. 3. When you are operating from concealment, you don’t want to give the bad guy the upper hand! LaserMax’s signature Controlled Activation™ (a simple, ambidextrous toggle switch) offers a clear advantage, enabling the shooter to unholster his or her firearm and assume a defensive grip without prematurely turning the laser on. A laser that comes on automatically could lead to a potentially risky reveal of the shooters position. The LaserMax option puts the laser emission point significantly closer to the bore line of the pistol, equating to a much closer relationship between the Point-of-Aim and Point-of-Impact. 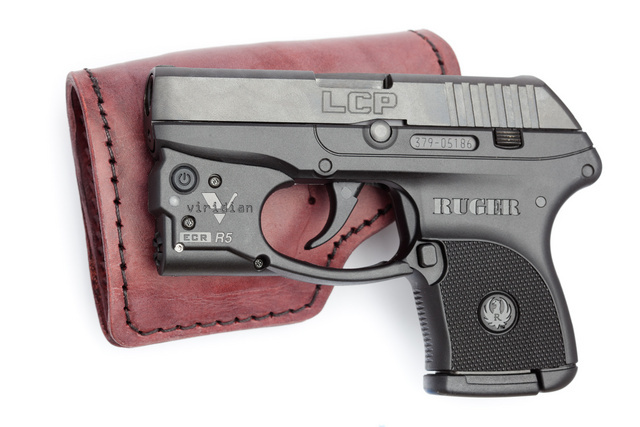 Yeah, because that’s really going to matter a lot on an LCP, isn’t it? (I am going to give you credit for admitting in your username link that you’re a spokesman for LaserMax – who I’m sure do make a perfectly fine product.